Movie Review - 'Inequality for All' - For Richer And For Poorer, But What Of That Vanishing Middle? In Inequality for All, former Labor Secretary Robert Reich takes on the income disparity that's been on the rise in America since the Great Recession. The film is inspired by Reich's book Aftershock: The Next Economy and America's Future. For Richer And For Poorer, But What Of That Vanishing Middle? 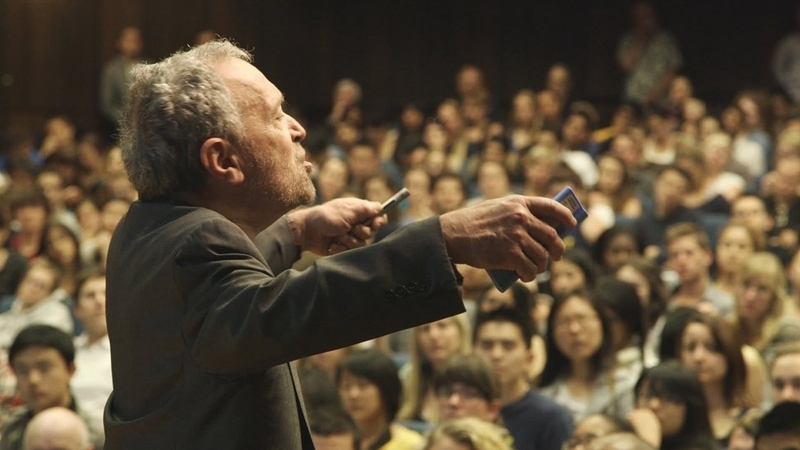 Former U.S. Labor Secretary Robert Reich, now a professor at the University of California-Berkeley, takes a look at growing income disparity in Inequality for All. Rated PG for thematic elements, some violence, language and smoking images. The U.S. financial sector's 2007-2008 swoon hurt a lot of people, but it's been a bonanza for documentary filmmakers with an interest in economics. The last five years have seen dozens of movies about the dismal science, most of them pegged to the Great Recession. Jacob Kornbluth's movie was inspired by Reich's book Aftershock: The Next Economy and America's Future, and uses as its narrative framework a class called "Wealth and Poverty" that the economist teaches at Berkeley. So the movie is essentially an illustrated lecture in the mode of An Inconvenient Truth: animated charts and graphs, on-the-road interludes and humorous asides designed to show that the speaker isn't too dislikably severe about the crisis that threatens Life As We Know It. Intercut with scenes of Reich's class are biographical recollections — a few of them pungent — and interviews with hard-hit former members of the middle class, including a Reich student who went back to school after losing his job. Also included is that bane of recent public-policy docs: footage from TV shows that profess to seriously discuss politics and economics, but rarely do. Reich has a good sense of humor, as is virtually required of an adult who's less than 5 feet tall — he has Fairbanks disease, the same condition that accounts for Danny DeVito's stature — so he's pretty much guaranteed a laugh when he hops to his feet and asks if he looks like an advocate of "big government." But the size of the federal bureaucracy isn't a major issue in Inequality for All. Reich's principal concern is the decline of the middle class, which he attributes to globalization and technology, but also to weaker unions and the rise of an ideology that insists the superrich be hailed and privileged as "job creators." Prosperous Seattle venture capitalist Nick Hanauer volunteers to rebut this argument, noting that rich people by themselves just can't spend enough to fuel the U.S. economy. "It's actually our customers that are the job creators," he contends. Reich agrees, of course. He attributes everything from a sputtering economic recovery to harshly polarized national politics to an income disparity that's as dramatic as that in 1929. But he doesn't analyze one key difference: The Depression narrowed the gap between the wealthy and everyone else, and the Great Recession hasn't. Interestingly, Inequality for All comes to much the same conclusion as Money for Nothing, a recent documentary about the Federal Reserve. Both decide that increased U.S. wealth is just a transfer to the rich from everyone else, not evidence of a growing economy. But if Reich has a solution, it's missing from Inequality for All. In a closing benediction from his final spring 2012 class, the professor cheerfully leaves it up to his students to fix everything. Then he packs up his graphs and heads for his Mini Cooper, as Dolly Parton begins "9 to 5" — a song that's about as relevant to today's increasingly part-time American labor force as "Working in the Coal Mine."